We are very blessed in that Gettysburg is only an hour away! We took a family trip there on Saturday and it was a nice visit. We mostly just walked around the town, had a picnic lunch, and visited the Soldier's National Cemetery. No battlefields or museums or anything. Relaxed and free. We only spent money on the gas! I love trips like that. 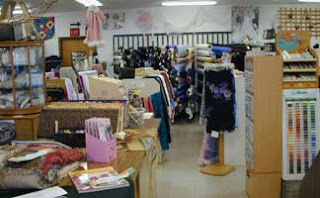 Well, in my online searches for period accurate fabric for my Regency dresses I found a fabric shop in Gettysburg that caters to reenactors called the Needle & Thread. So.... while we were there I asked a lady in a costume shop where it was and she was able to tell me (of course!). And after we were done walking around, we took a little detour out of town to the fabric shop. Boy, was it worth the trip! This store was in a medium-sized warehouse type building and it was chock full of historically accurate (1860s mostly) cotton prints, sheer cottons (swoon! ), silks, cotton velveteens, one entire row dedicated to linens (unheard of! ), and two rows just for wool! I was in fabric paradise! I wandered around in a bit of a daze. I seriously didn't know what to look at first. See, usually, I have to hunt and scour a fabric store just to find a handful of fabrics that are passable for historical costume. Being surround by countless bolts of possibilities was a shock to the system. In fact, I'm still recovering! My poor husband, I know, was in torture, and my kids were running around screaming happily in the maze of fabric rows. After about 20-30 minutes I tore myself away and vowed to come back soon. Alone. With plenty of time and a little stash of cash. :-) Ooooooh, I can hardly wait! !